With Freestyle Lite Test Strips, you can test anywhere with less pain and less time! Patented ZipWik tabs target blood sample for easy application and fast uptake. No coding required means one less step, proven accuracy, fewer wasted test strips, Up to 60 seconds to reapply blood. The worlds smallest sample size of just 0.3 is all that is needed to get accurate blood glucose readings. Freestyle Lite Test Strips support Alternate Site Testing, so you can test from your fingertip, palm, forearm, upper arm, thigh, or calf. 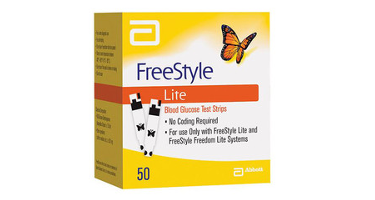 FreeStyle Lite Blood Glucose test strips are compatible with Abbott FreeStyle Lite Blood Glucose Monitoring System and Abbott FreeStyle Freedom Lite Blood Glucose Monitoring System.